In yet another memorable contest between the two fierce AFC North foes, the Steelers outlasted the Bengals, 24-16, at Heinz Field on Sunday to improve to 2-0. Running back DeAngelo Williams was the offensive catalyst for the second week in a row, as he carried 32 times for 94 yards against a very stout Cincinnati defense. Williams also caught four passes for 38 yards and a touchdown. It wasn’t the best of days for quarterback Ben Roethlisberger, who completed 19 of 37 passes for 259 yards, three touchdowns and two interceptions, as he struggled with accuracy due to the day-long rain at Heinz Field, as well as with pressure by the Bengals formidable pass-rush which was in his face most of the afternoon. However, like he has most of his career, Roethlisberger did just enough to secure a victory. Late in the first quarter of a scoreless game, Roethlisberger escaped pressure, moved to his left and found second-year receiver Sammie Coates for a 44-yard catch down the the Cincinnati 21. Two plays later, No. 7 connected with Xavier Gimble at the five-yard line, and the rookie tight end made a great individual effort to break a tackle and dive into the end zone to make it 7-0. The Bengals immediately responded with a scoring drive of their own, that ended when kicker Mike Nugent connected on a 25-yard field goal to make it 7-3. The defensive struggle continued over the next six possessions, as the two teams traded punts back and forth. However, after Bengals punter Kevin Huber only got off a 32-yarder deep in his own territory, the Steelers had great field position at the Cincinnati 36. But Pittsburgh quickly went three and out and had to settle for a 49-yard Chris Boswell field goal to make it 10-3. With a minute remaining in the first half, Roethlisberger tried to connect with Coates once again, this time on a deep pass down the right sideline. But cornerback Dre Kirkpatrick intercepted the pass, and the Bengals took advantage, by converting Roethlisberger’s second pick of the half into another Nugent field goal to make it 10-6 at the break. Late in the third quarter, Ben Roethlisberger went to the deep well once again, and found Sammie Coates for a 53-yard gain down to the Bengals nine-yard line. One play later, Roethlisberger connected with tight end Jesse James to make it 17-6. The Bengals began moving the ball on their next offensive possession, and after a 20-yard pass-interference penalty on cornerback Ross Cockrell who was trying to cover A.J. Green, Cincinnati had it first and 10 from the 14. Three plays later, it was first and goal from the one, after rookie cornerback Artie Burns was also flagged for interference while breaking up a pass intended for Brandon LaFell. But, much like it did most of last season, Pittsburgh’s defense bent, but it didn’t break. Jeremy Hill was stopped for a two-yard loss on first down. On the next play, quarterback Andy Dalton tried to hit tight end C.J. Ozomah in the back of the end zone, but safety Robert Golden made a great play by pushing him out of bounds before he could get both feet in. On replay, it appeared Ozomah got one knee down before going out of bounds, which would have been a legal catch, but the Bengals didn’t challenge. After another incomplete pass by Dalton on third down, Nugent made it 17-9 with his third chip shot of the afternoon. Early in the fourth quarter, Pittsburgh began a 12-play drive that covered 68 yards, consumed 6:54 of game clock and ended when Ben Roethlisberger found Williams all alone in the end zone for a six-yard score to make it 24-9 with 6:48 left. The key play on the drive came when Roethlisberger scrambled for 14 yards to set up a first and goal from the five. 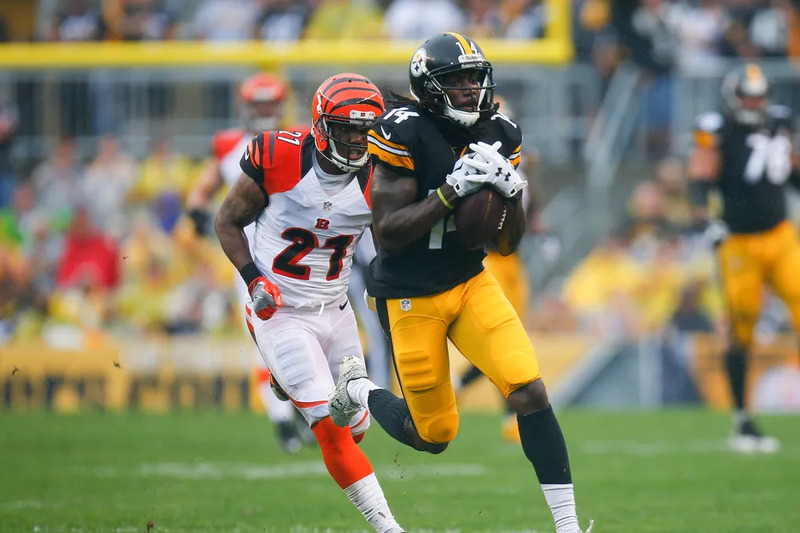 But the Bengals weren’t done, and they quickly marched 75 yards in eight plays and made it 24-16 when Dalton hit Giovani Bernard on a short pass, and the running back eluded several Steelers on the way to a 25-yard touchdown. After Pittsburgh did nothing on its next offensive series (and only burned 25 seconds off the clock), the Bengals took over at their own 25 with three minutes remaining. With short passes over the middle, Dalton advanced his offense to the Steelers 39-yard line by the two-minute warning. However, one play later, after a quick pass to rookie receiver Tyler Boyd, linebacker James Harrison forced a fumble, and Golden recovered with 1:50 remaining. On replay, it appeared Boyd’s knee was on the ground just as the ball came free, but after an automatic review, the play stood, and the Steelers prevailed. While Dalton threw for a ton of yards (366) and didn’t throw any interceptions, the Bengals offense was denied touchdowns on three trips inside the Red Zone. As for Green, he was once again stymied by Pittsburgh’s much-maligned secondary, who held him to two receptions for 38 yards. Next up for the Steelers is a Week 3 road date with the Eagles next Sunday at 4:25. This entry was posted in Steelers 2016 Season and tagged Ben Roethlisberger, DeAngelo Williams, James Harrison, Jesse James, Pittsburgh Steelers, Sammie Coates, Steelers vs. Bengals, Xavier Grimble. Bookmark the permalink.